It's New Zealand week again! 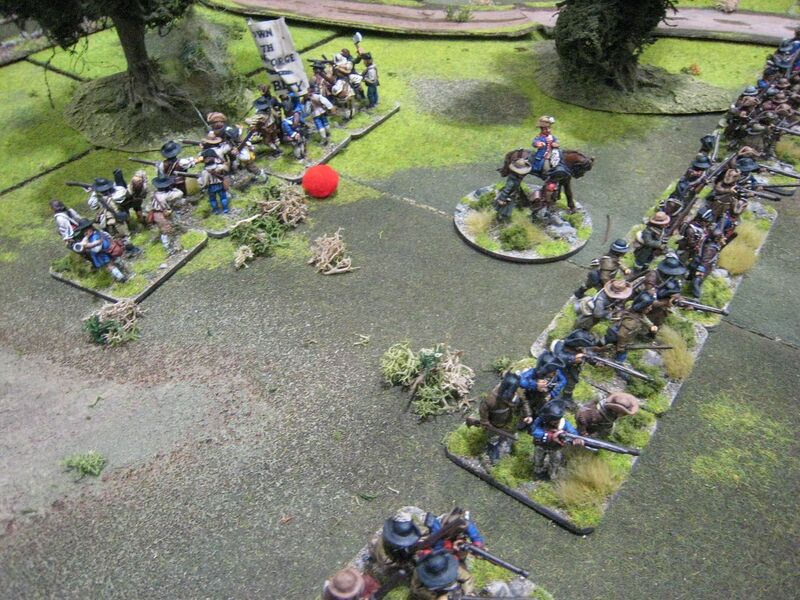 Just over 4 years ago I did a series of posts on the New Zealand Wars of the 1840s - see here. 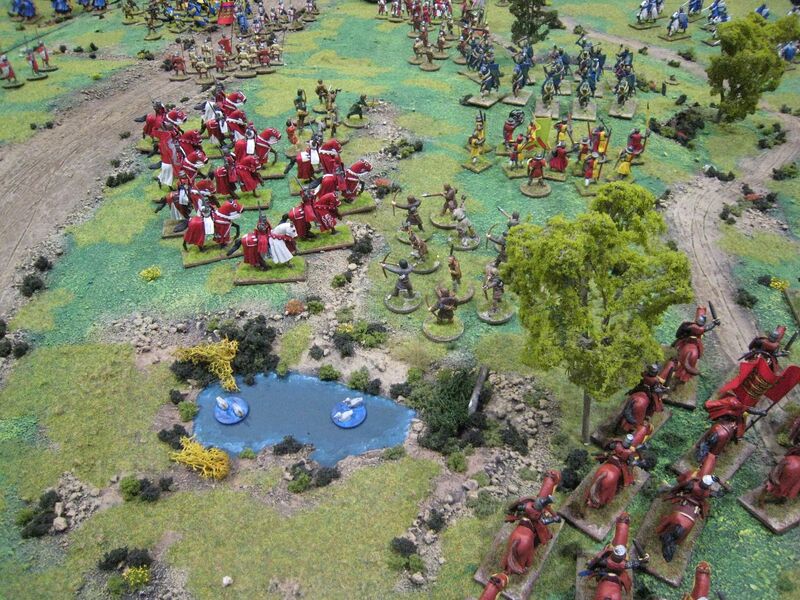 It's taken me a good while to return to the period, but over the next few days I'm going to do another series of posts on more Empress Miniatures figrues that I have painted recently. 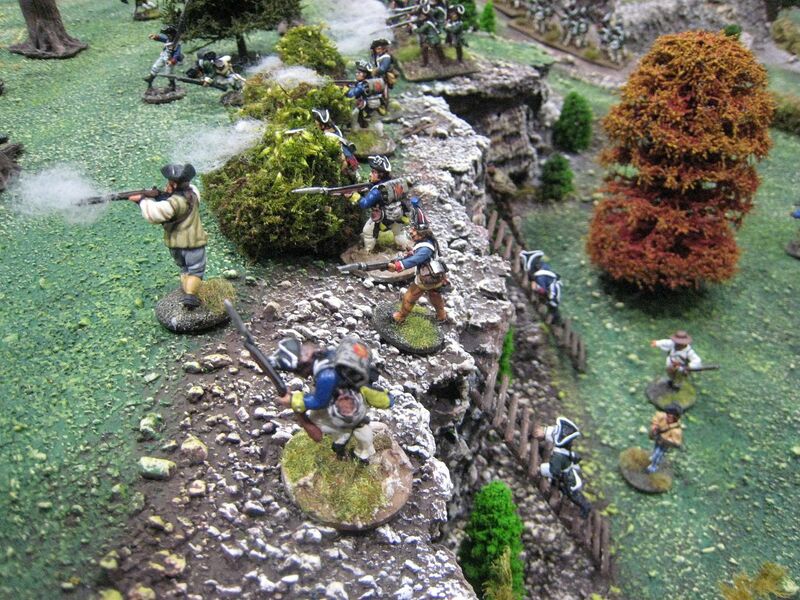 My earlier series of posts described the history of the war of 1844-45 and I won't repeat that. Instead, I'll concentrate on a few uniform and painting notes and I'll add some more factual snippets from my last couple of visits to New Zealand. 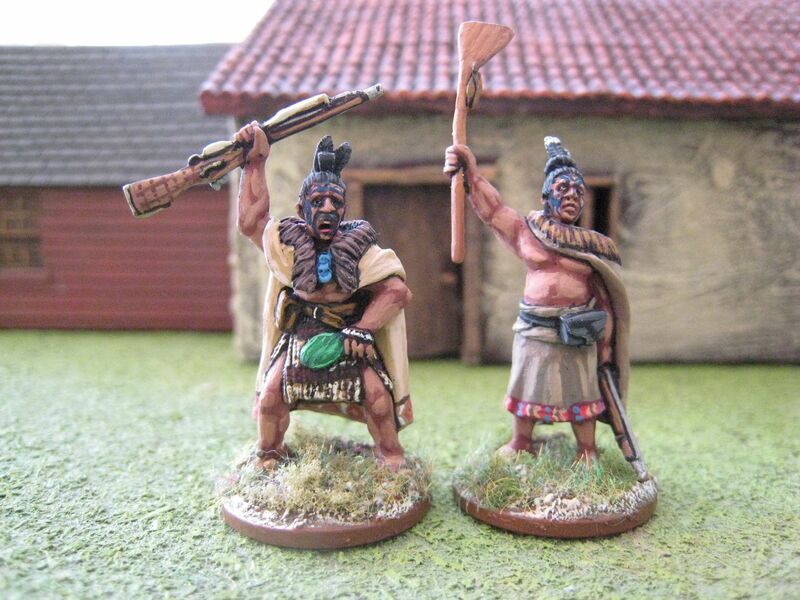 First up are some Maori chiefs that for some reason I didn't get around to painting last time. 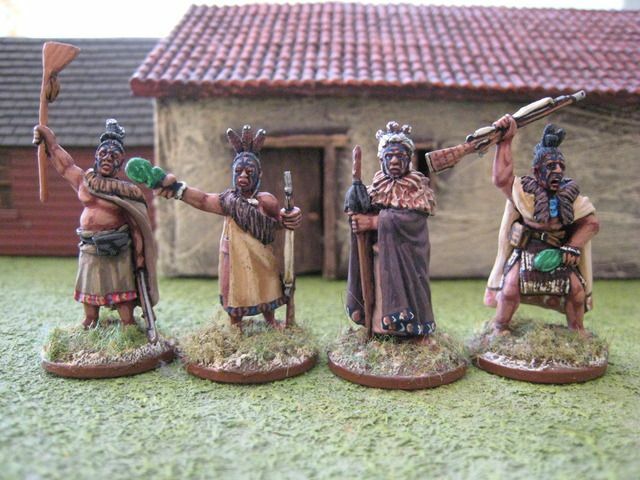 These figures are from a chieftains pack (together with a Hone Heke personality figure) apart from the chap at the end on the right, who is from a characters pack. 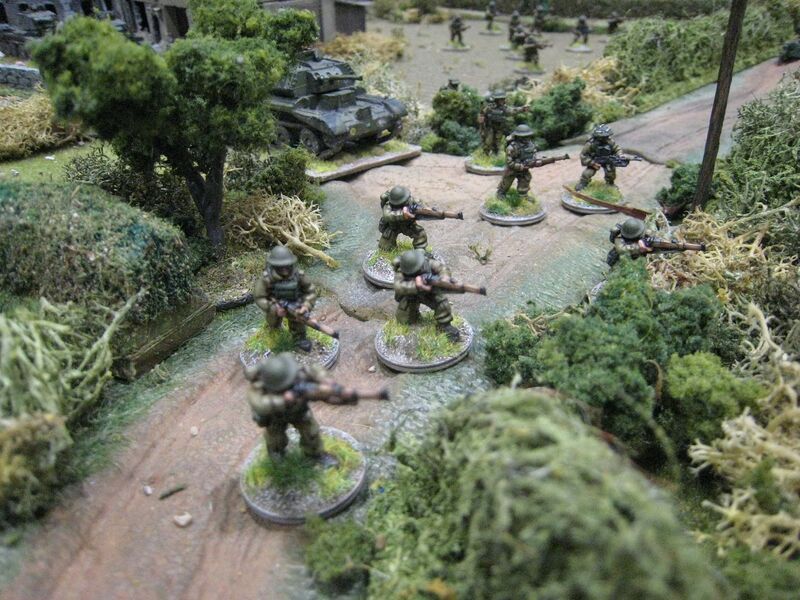 Lovely figures in good, dramatic poses and, as always from Empress, very clean sculpts. The illustrations I have seen show Maori cloaks and clothes from this period as being largely brown and beige in colour with limited woven geometric patterning. I added some coloured borders to the cloaks to reflect the status of these men (taniko is the word in Maori, apparently). 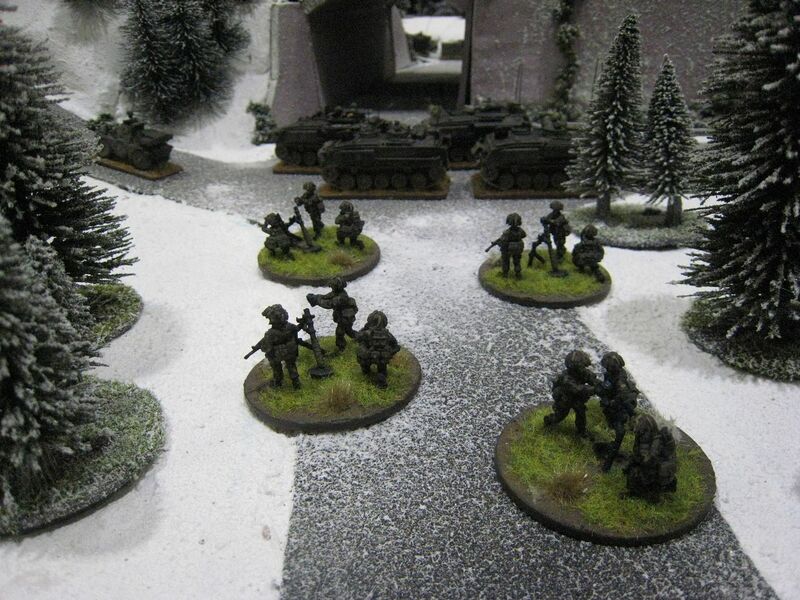 Zig-zags and chevrons seem to have popular patterns and these are pretty easy to paint. There are various words for the weapons used by the Moari. The two greenstone weapons here are probably kotiate rather than mere clubs, and the former were usually made of wood or bone rather than jade or greenstone. However, again I wanted to make these leaders distinctive and so decided to paint them green (using the Foundry "Bright Green 2"5 palette). The long club that the chap on the left is brandishing is a tewhatewha, and it was customary for those weapons to be decorated with bird feathers. Rifle stocks often had carved decorations and I have tried to reflect that as well. 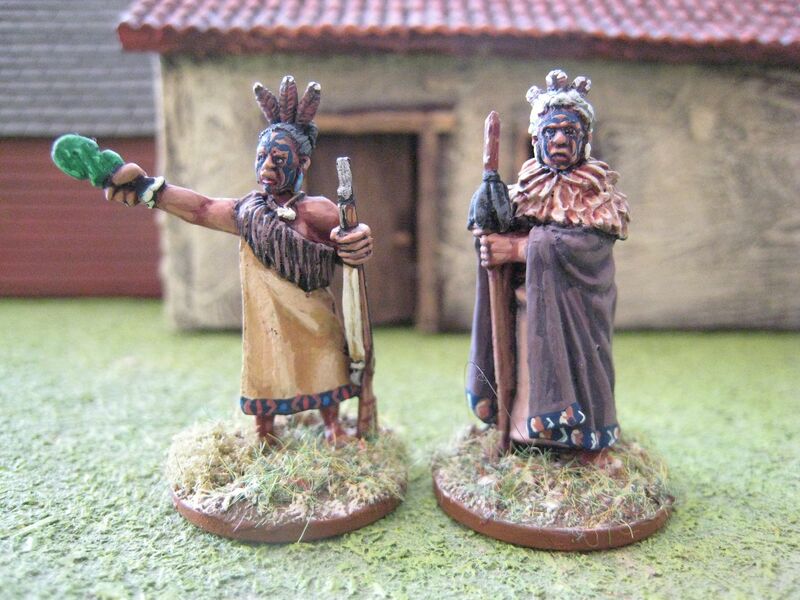 As explained in my earlier posts, I paint Maori skin with the Foundry palette "South American Flesh 119". 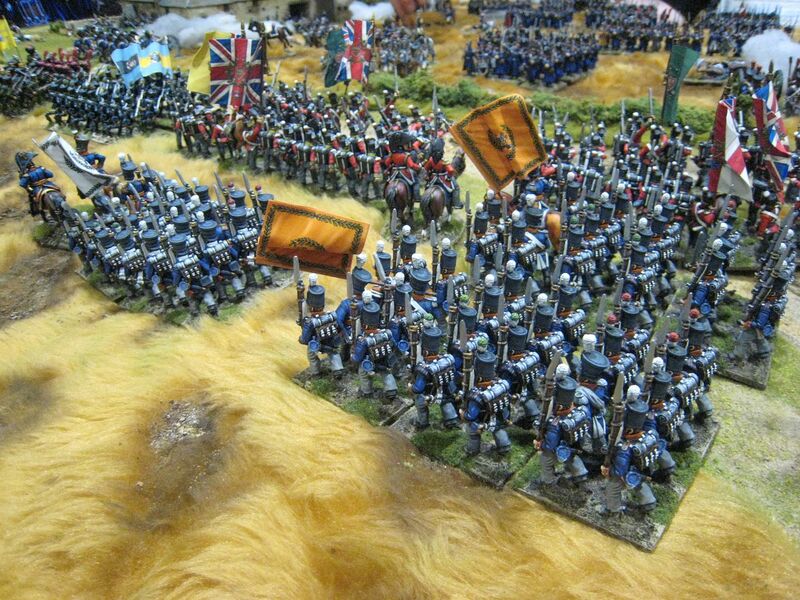 That may be a bit light, but it is suitably distinctive to my European colour scheme. Anything darker and the tattoos would be less noticeable. Those I paint with a dark blue colour rather than black (Foundry "French Blue 65A"). I have seen portraits and photos of old Maori whose faces are covered in tattoos. With these figures I have tried to add a few more tattoos than I do with "rank and file", but still adhering to a "less is more" approach. More Maori tomorrow, then the Royal Navy and British infantry. Four figures. Painted March 2015. I've failed to live up to my blog intentions yet again, but I do have drafts in the works and I'm determined to make more of an effort now. Salute took place on Sunday and already you can see dozens of photos of everything on various sites and blogs. I've added 30 or so more below. I arrived at about 11.15 (which realistically is the earliest I can get there from Chelmsford) and there was no queue at all, and even better there were still plenty of freebie bags being handed out so I didn't miss out on the show exclusive Perry plastic Agincourt figure. The hall itself initially felt very cramped and crowded; indeed walking around for the first half hour felt quite oppressive. But things then eased out as people moved around the hall and while many trade stands were completely mobbed by customers (a couple of traders told me at the end that they had had very successful days) it became easier to move around after midday. 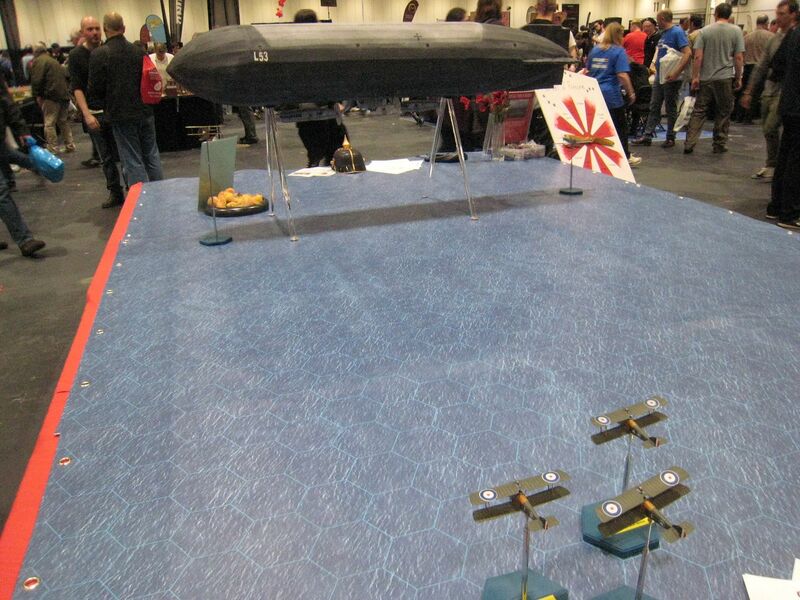 The main thoroughfares were bigger, there were more tables to pause at to re-arrange one's rucksack and I thought that this year the Warlords had really cracked how to maximise the Excel space. 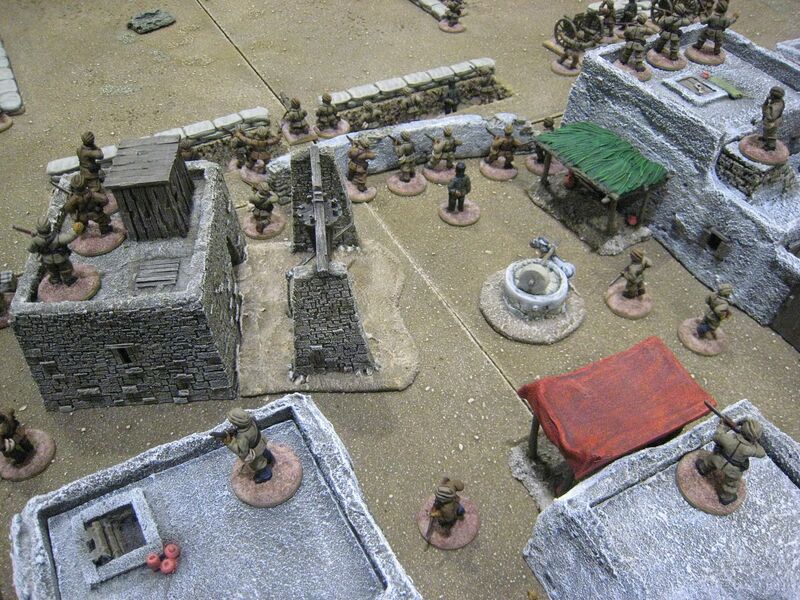 It was also useful that just down the corridor was a Sherlock Holmes convention, with many attendees in period costume - so we wargamers didn't stick out in the Excel Centre as much as we usually do. 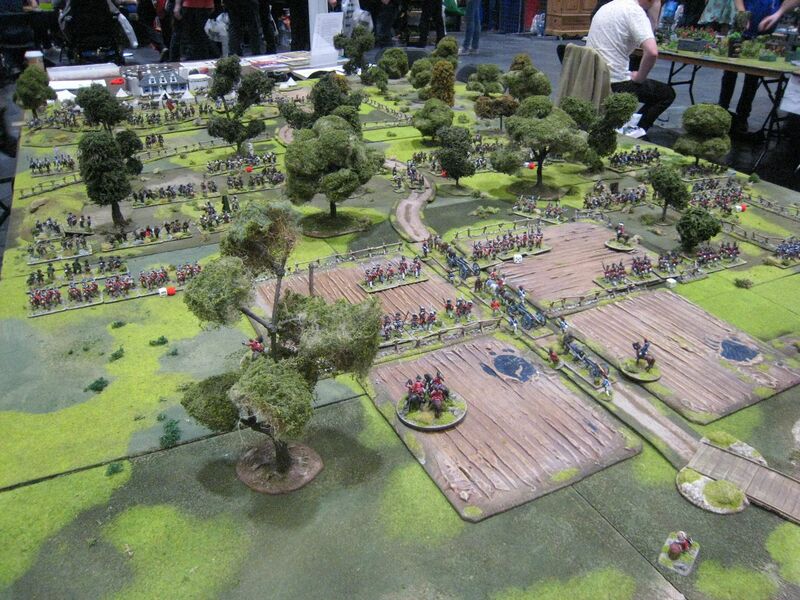 I walked around the show with my usual gang of mates - Malc "Little Armies" of the Ten Figures a Week blog, Timmo and Ronan the Librarian/Supercilius Maximus, and chatted to Eclaireur, Levied Troop, Martin at Foundry, Martin from the Warlords and the Loughton guys on the way. 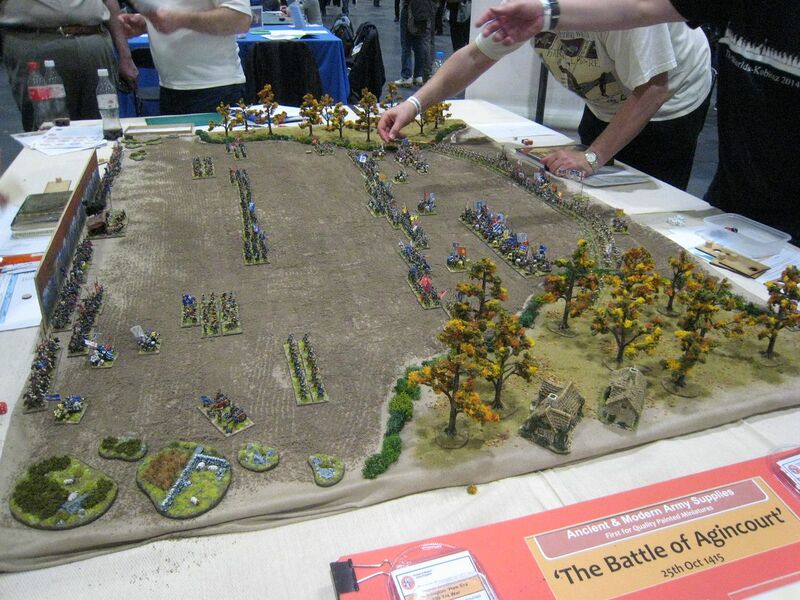 I finally managed to meet some people I've known "virtually" for some time - Steve Jones, whose outstanding Guilford Courthouse game won an award, and John Fletcher, the guru behind "Liberators!" 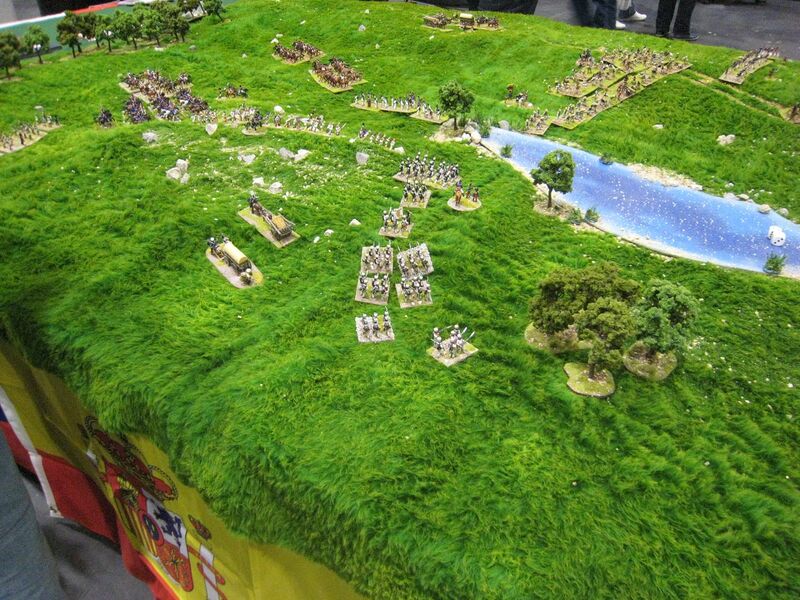 and wargaming the South American wars of independence (the subject of my very next post - honest! 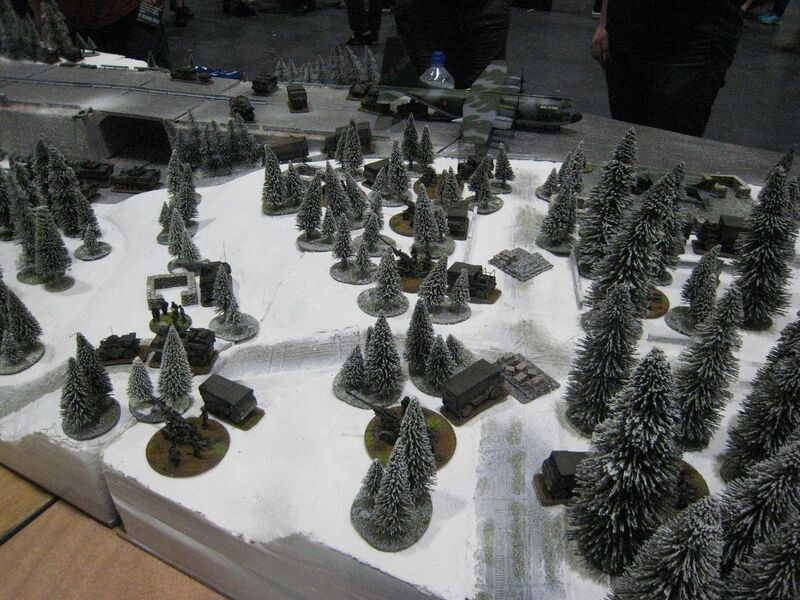 ), who gave me good advice on the look of terrain for this period. I thought that while there perhaps not as many "stand out" games as usual the general standard was higher than last year. 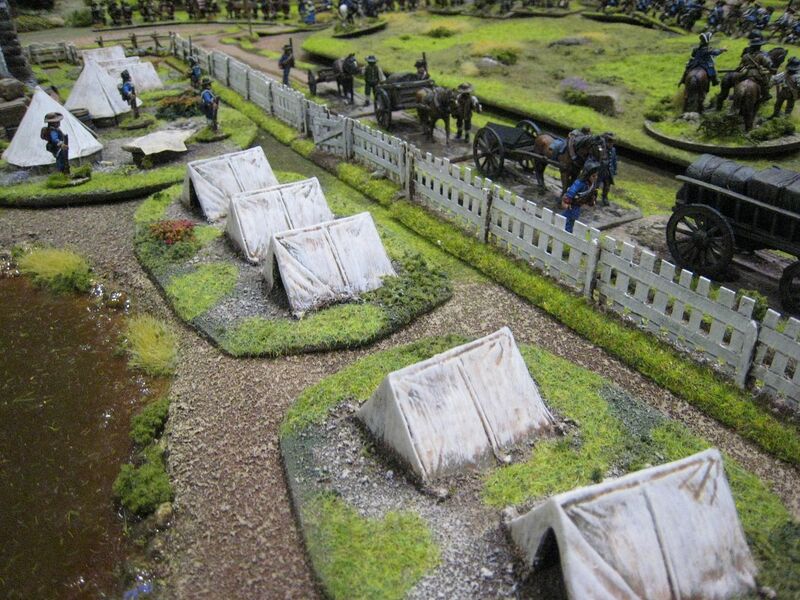 Certainly the terrain used was generally very good - green baize seems to be history now and most of the games had bespoke terrain to some extent. 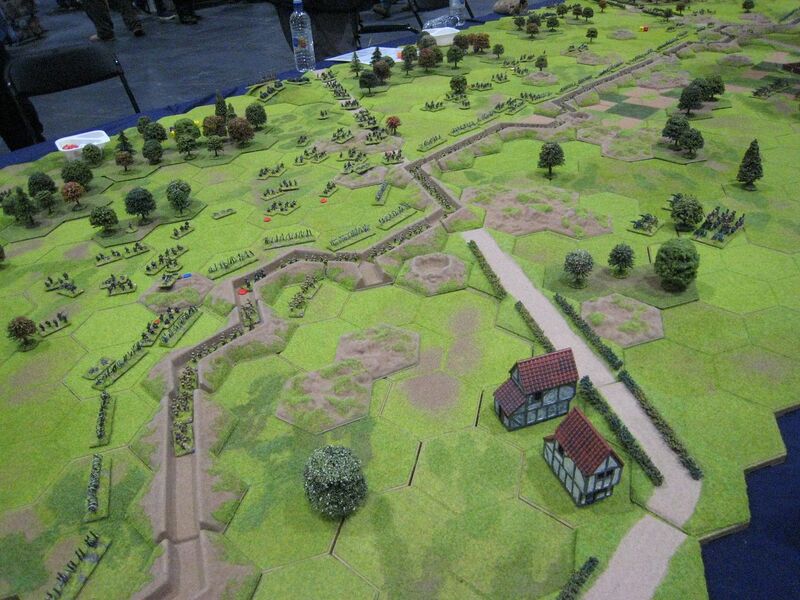 A lot of the games seemed tied to either a particular set of rules or a range of figures (sometimes both) - nothing wrong with that. I also thought there were more children and families - I'm aware that I always say that and perhaps I notice them more now that I'm beginning to think about when it might be worth bringing Hugo and Monty. 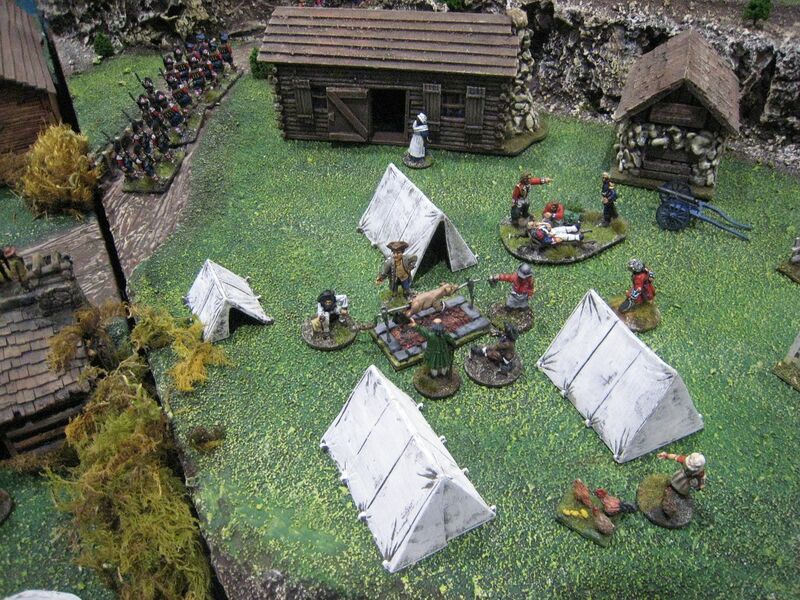 My purchases were light - renewing my Wargames Illustrated sub, some Foundry paints, a couple of packs of Perry figures (the Ewart Waterloo vignette and the AWI camp set), another box of Perry plastic 1815 French infantry and a Maori warband from Eureka. Malc kindly gave me two bottles of his company's recently released Fonseca "Waterloo Edition" port (see a glowing review here). YUM. 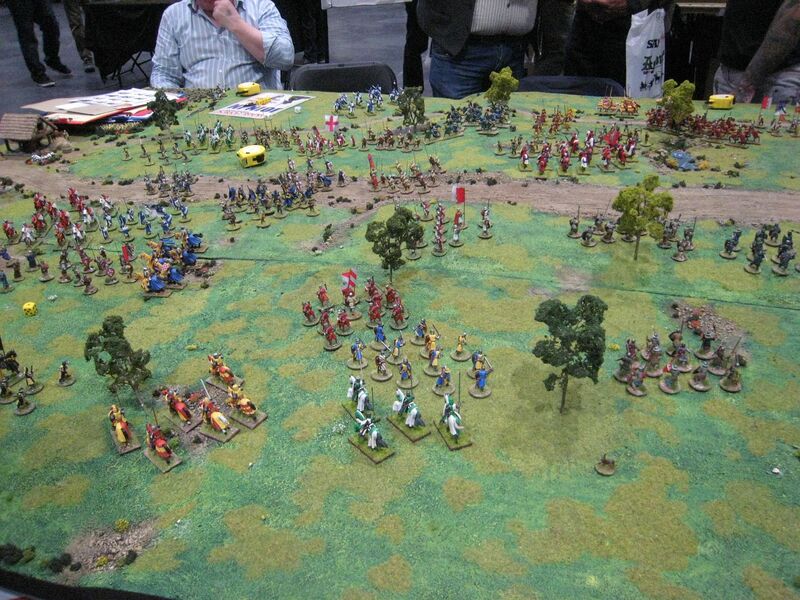 There were two AWI games this year. 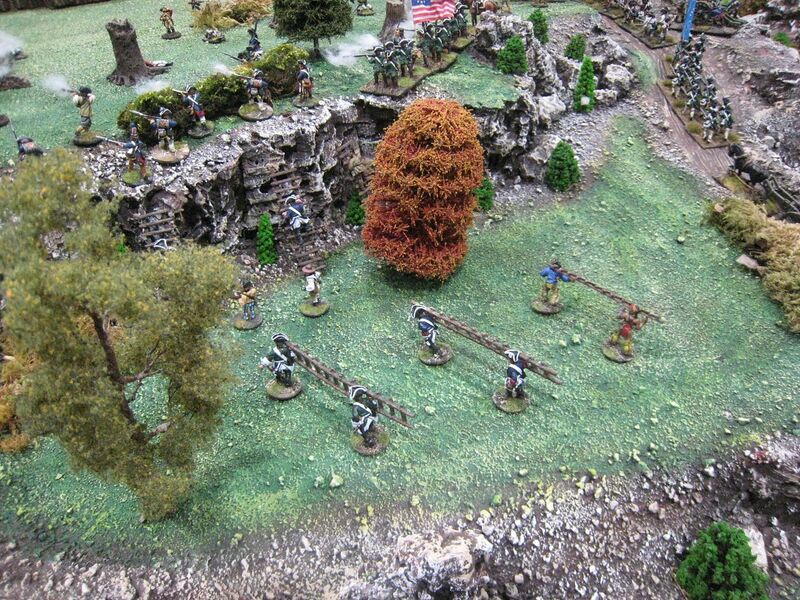 The first was Guilford Courthouse, a magnificent effort that I thought looked perfect: just the right number of trees; plenty of space to move around; soggy-looking fields in front of the American first line; beautifully-painted figures. The whole table is shown at the top of this post, and some other shots are below. 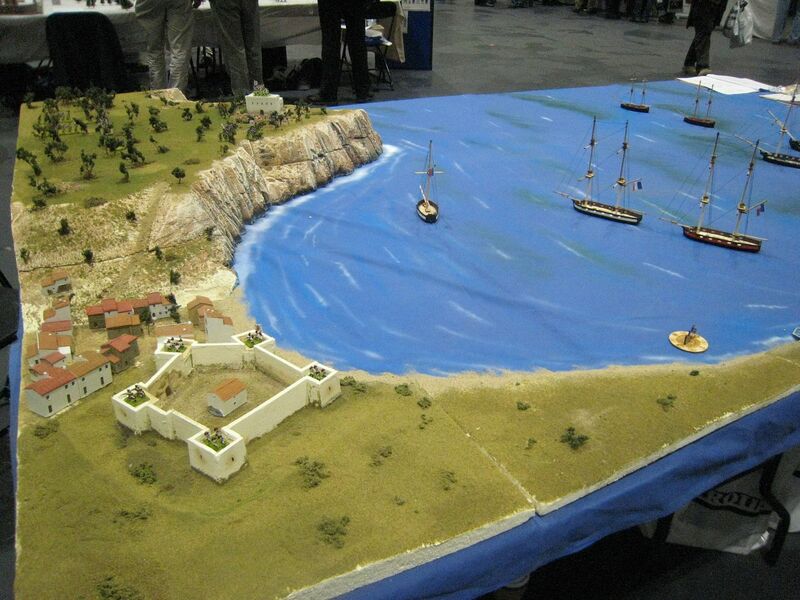 The other AWI games was put on by the Essex Gamesters - a typically enormous game featuring Ron Ringrose's 25mm scaled ships. 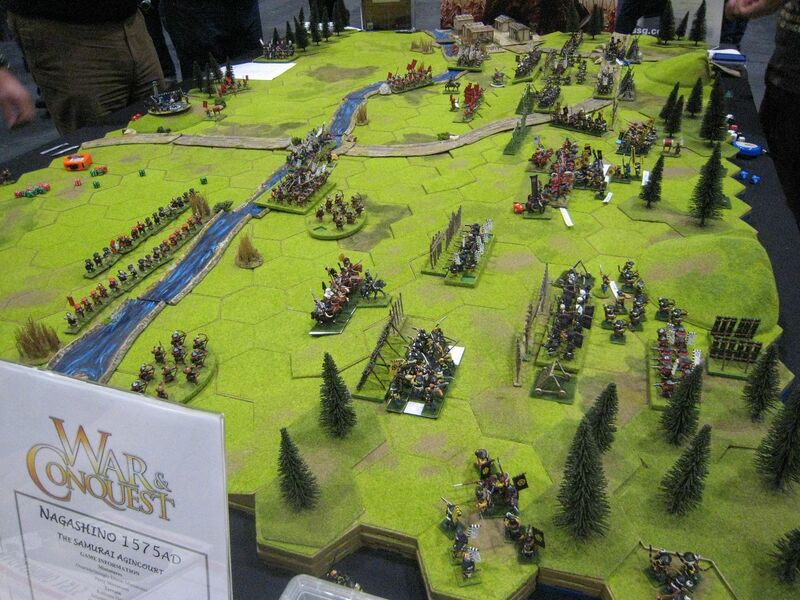 The game was based on the Penobscot Expedition of 1779, dramatised by Bernard Cornwell in his novel "The Fort". 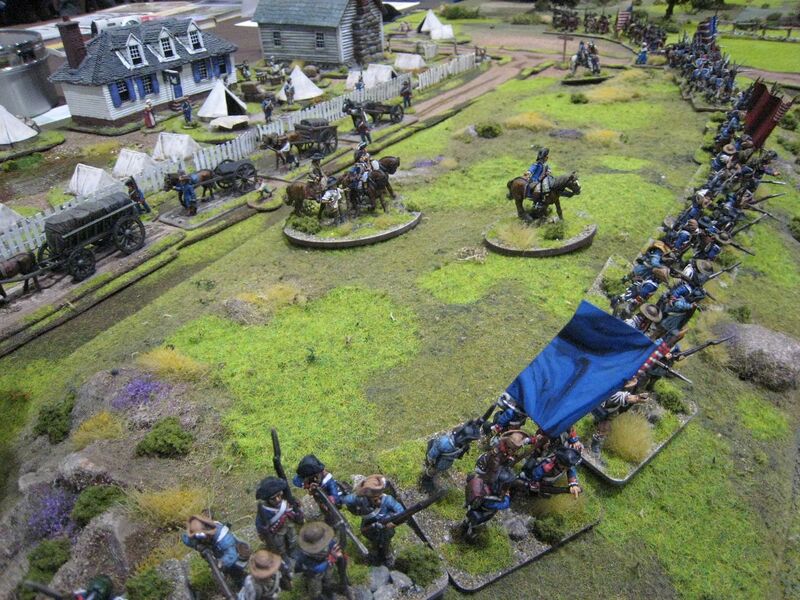 I failed to take a grand sweeping photo of the whole thing, but here are some details (not sure why there's a Hessian joining the Continental assault in the 7th photo). 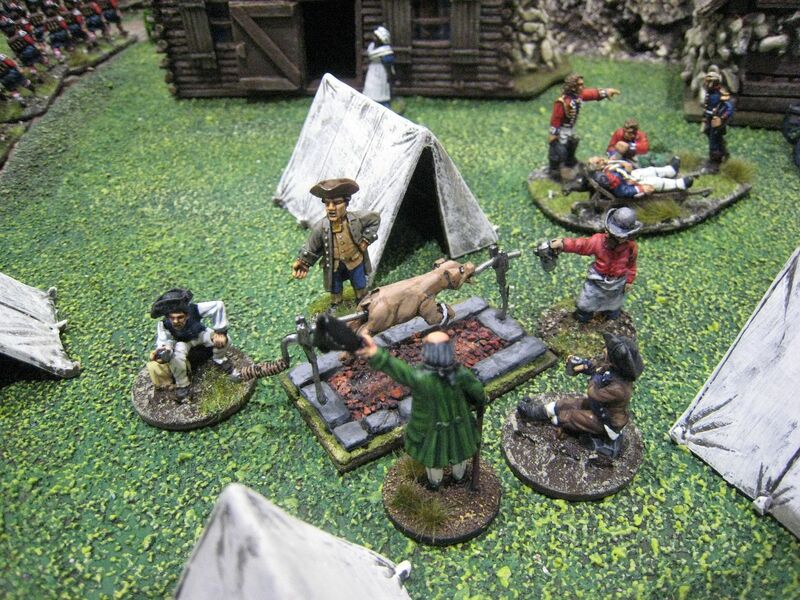 I liked seeing pretty much every 25mm 18th century figure that's ever been released in this game, and also some Foundry Wild West "Mountain Men" which looked pretty good as militia types. 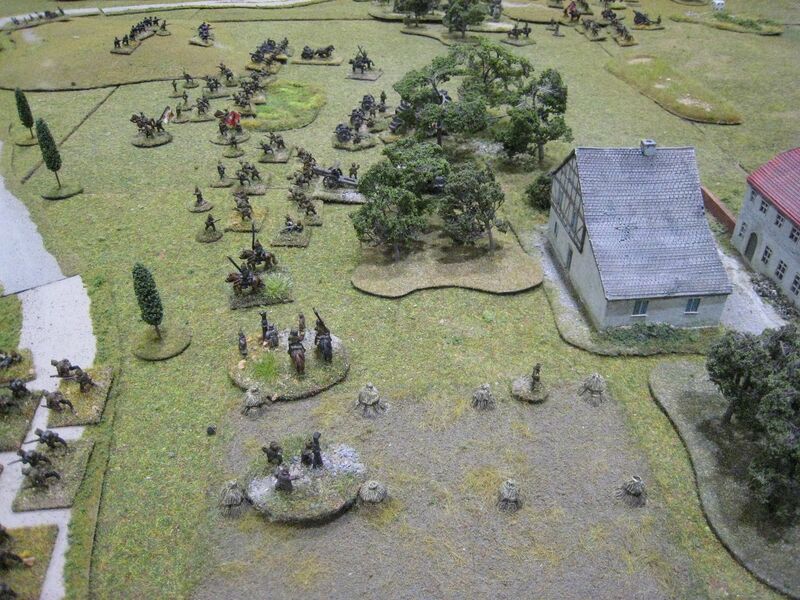 Here are photos of some other games. 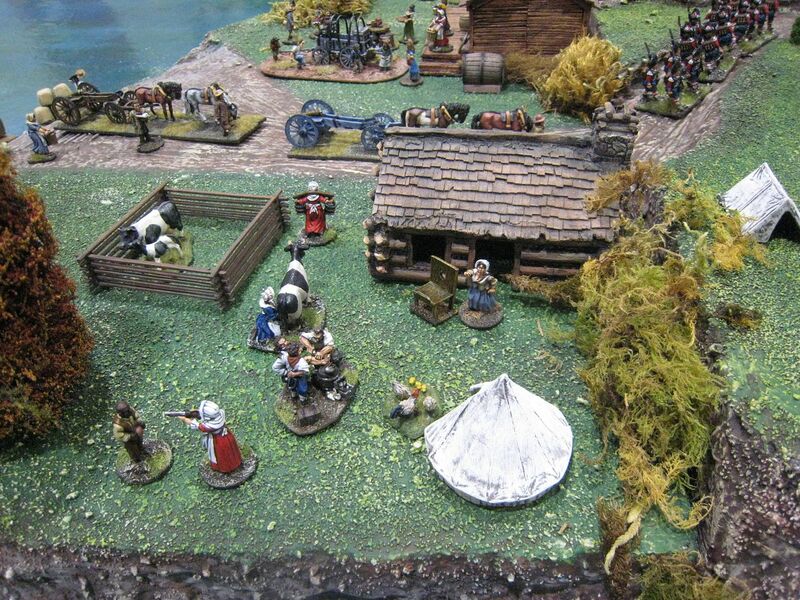 As always, I'm aware that I missed some games completely (such as Dalauppror's Stockholm 1392 and the Two Fat Lardies' game) and didn't take photos of all those I did see. So apologies to those not featured below. 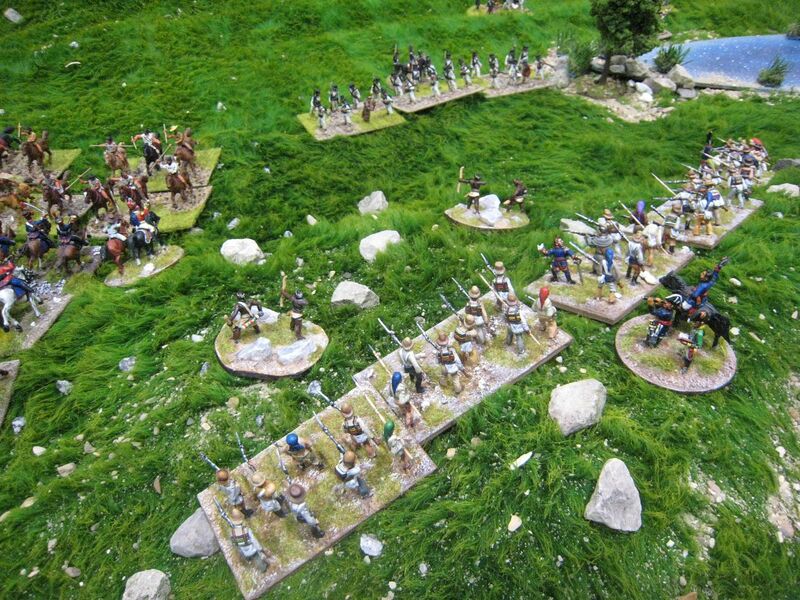 Here is the Warlords' "Liberators" game, the battle of Araure 1813, using a variety of 20mm plastic figures with ingenious conversions. 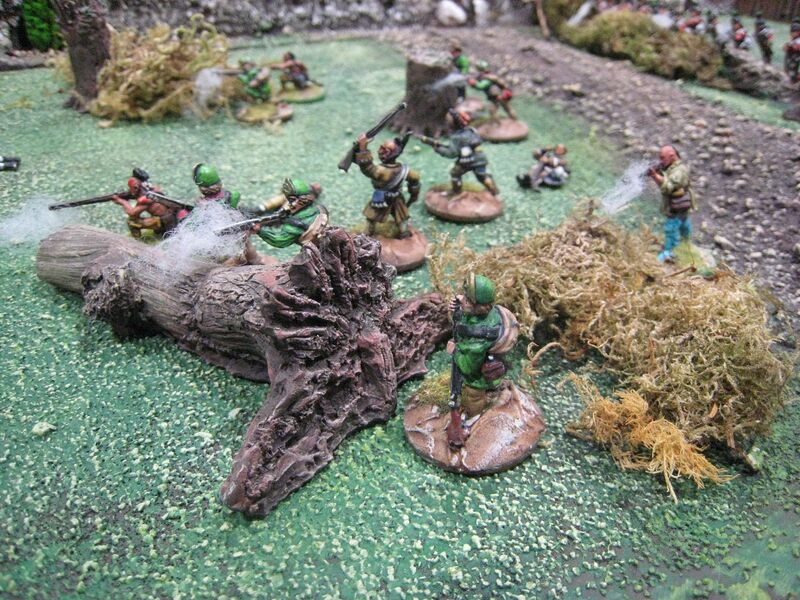 This was one of my show highlights, and Martin Gane and the Warlords did a great job on advertising this colourful and exciting period. 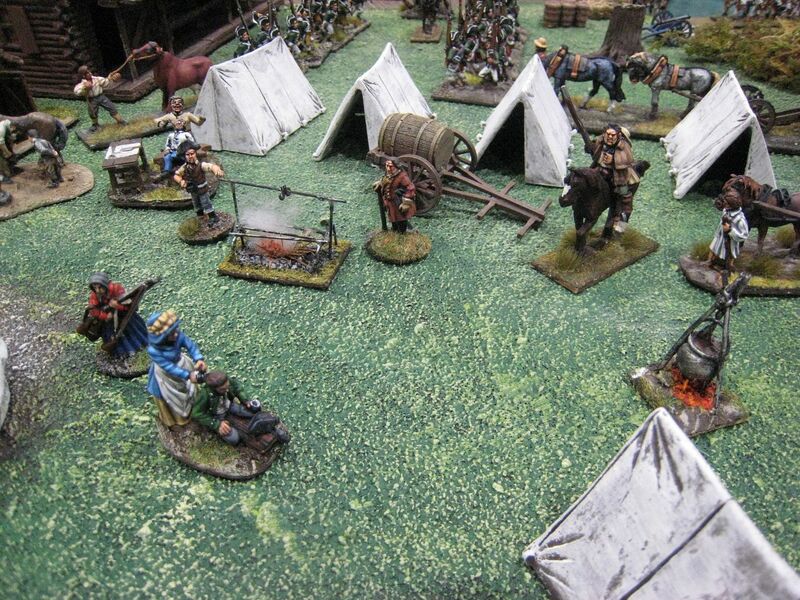 Wargames Illustrated had several games. Here are three of them. 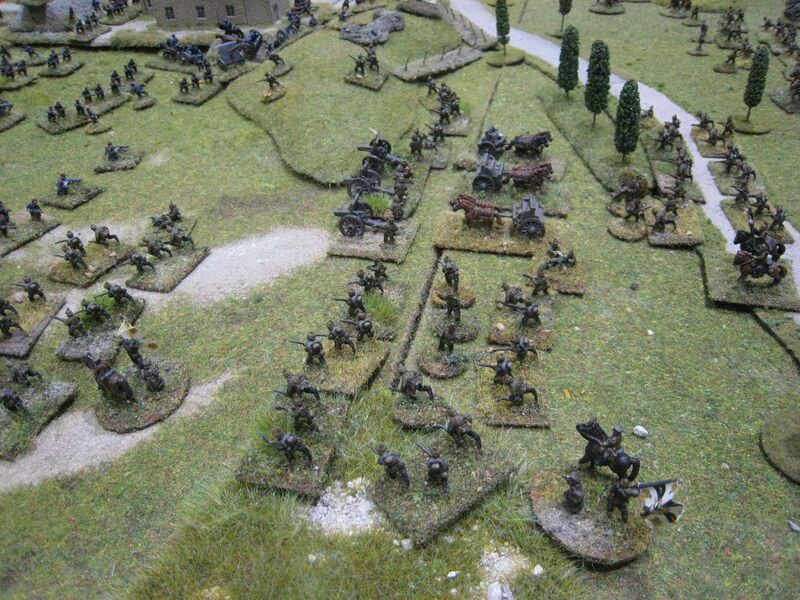 The first is Beersheba 1917, with the Australian Light Horse charging a Turkish position. 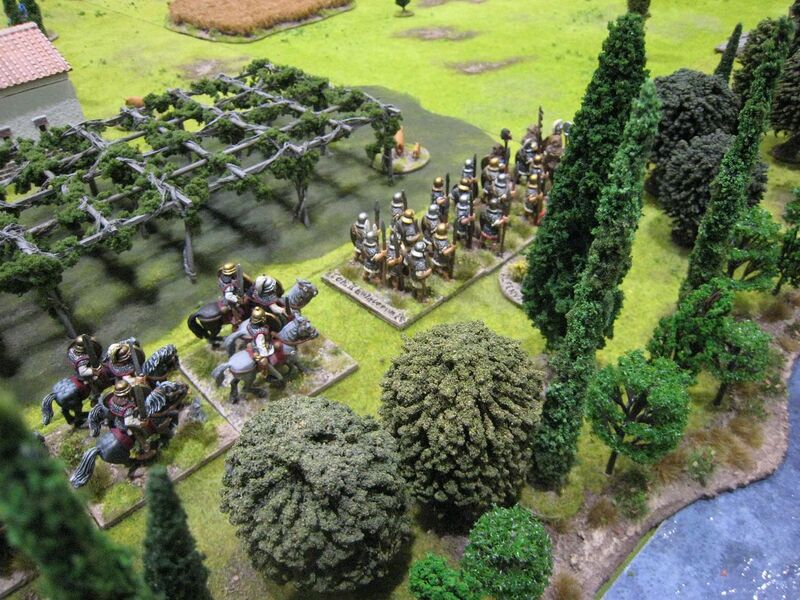 Lovely terrain and figures; sadly the only photo I took of the Australian cavalry was badly blurred. 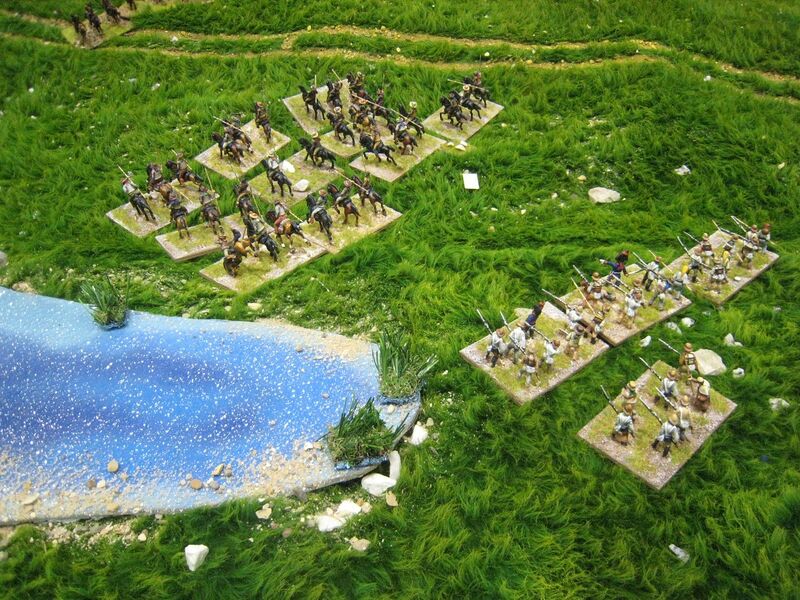 Secondly, here is the Battle of Evesham 1265 in 25mm. 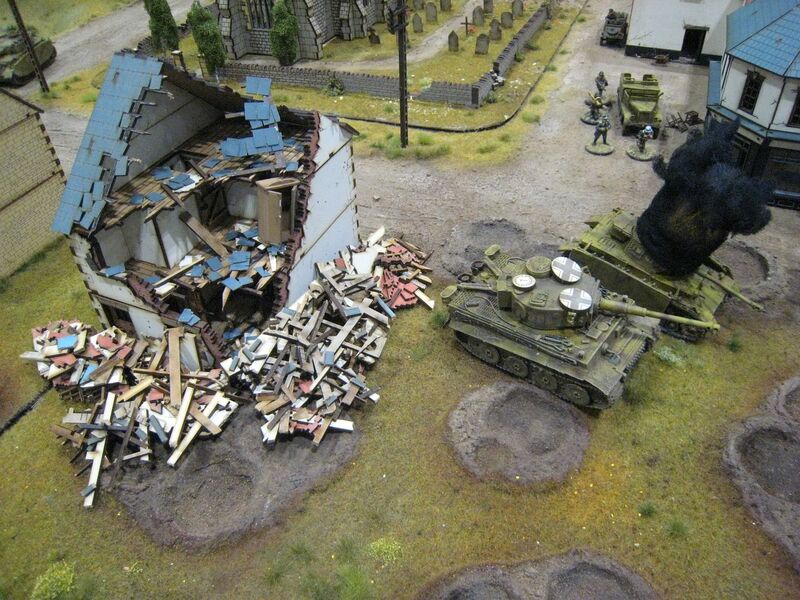 Thirdly, a "Cold War Gone Hot" game. 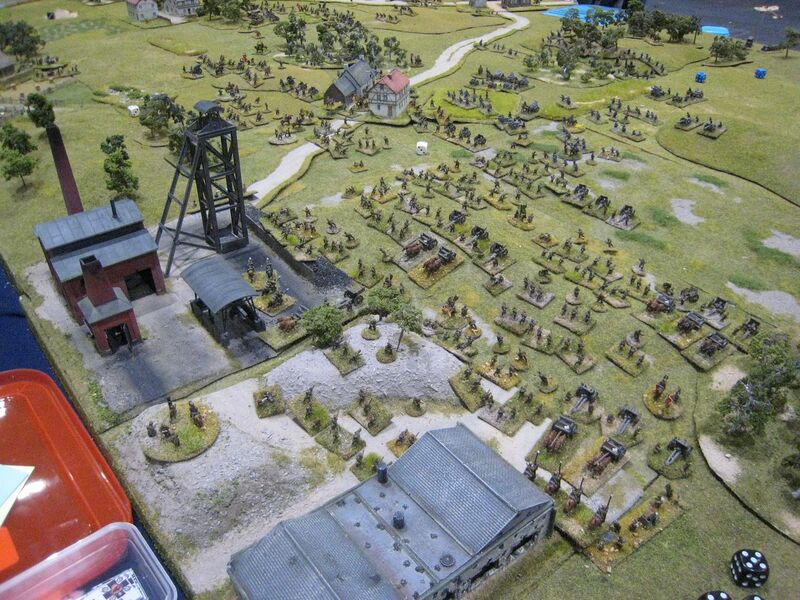 This 1914 game in 10mm by Real Time Wargames had lovely terrain and showed what can be achieved with smaller scales. 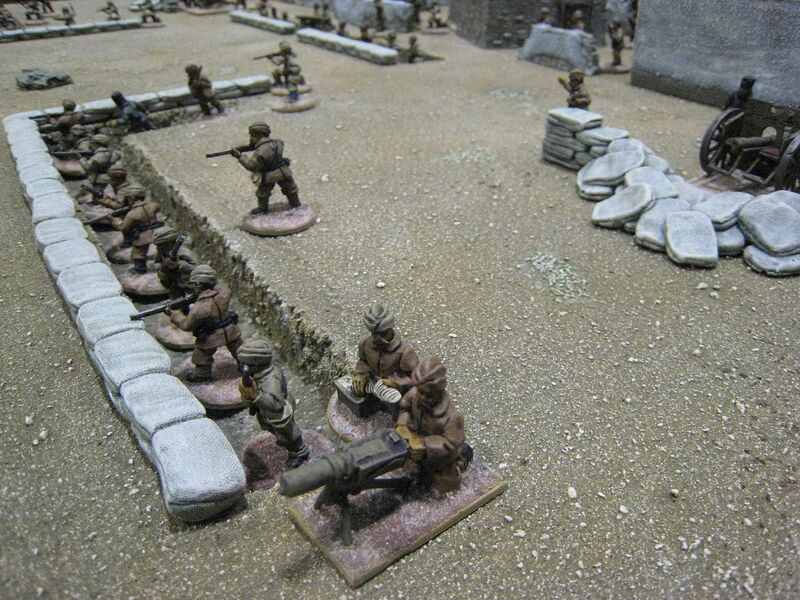 This is another small figure WW1 game, I think First Ypres from Wyvern Wargamers. 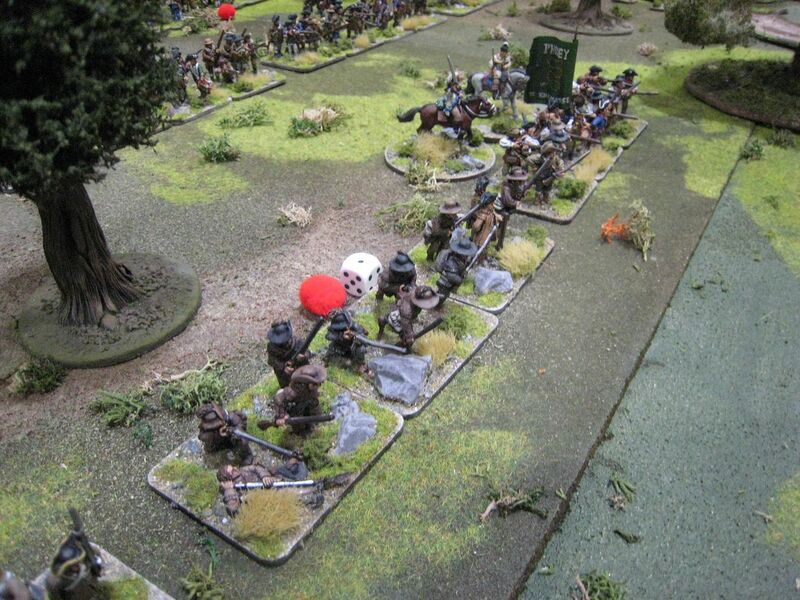 CTK Wargaming's "Zap the Zepp" WW1 game. 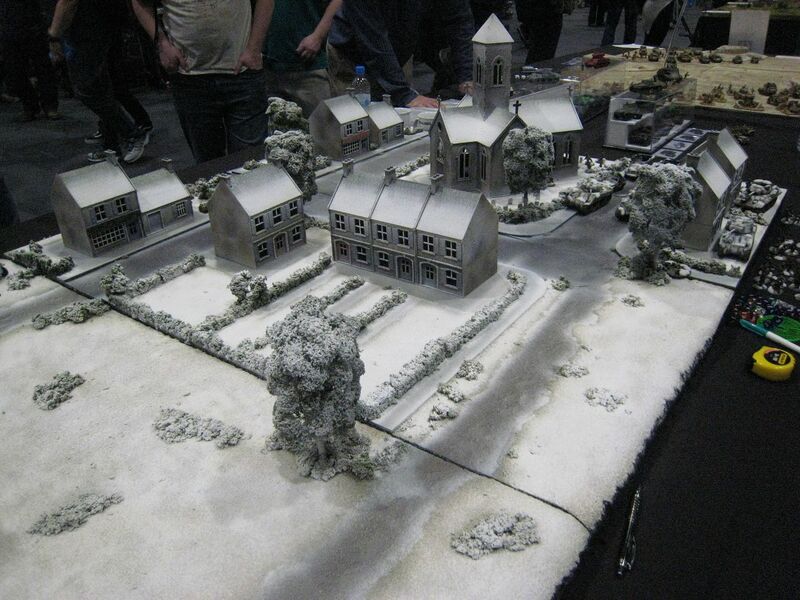 This was Wyre Forest Gamers' beautiful Great Northern War game, Fraustadt 1706, with fantastic snow-effect terrain. 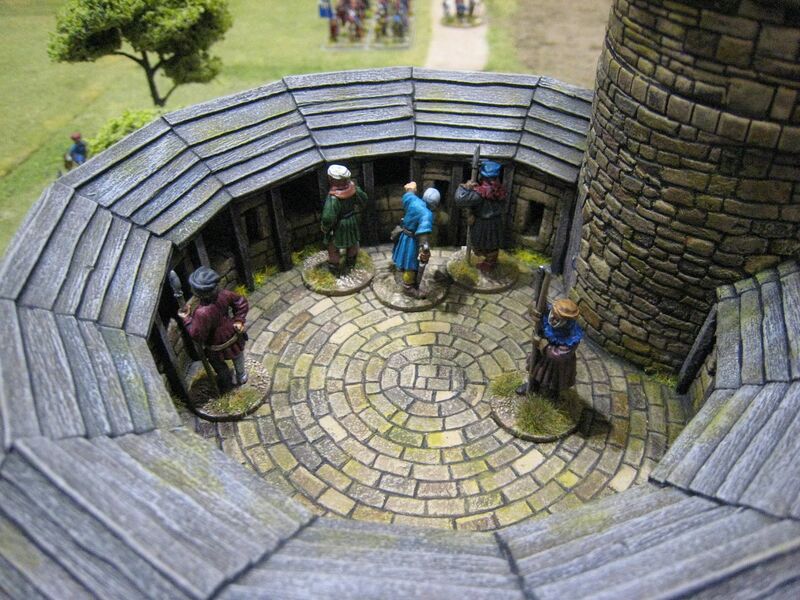 Again it demonstrates what 6mm can do that is very difficult to replicate in 25mm. 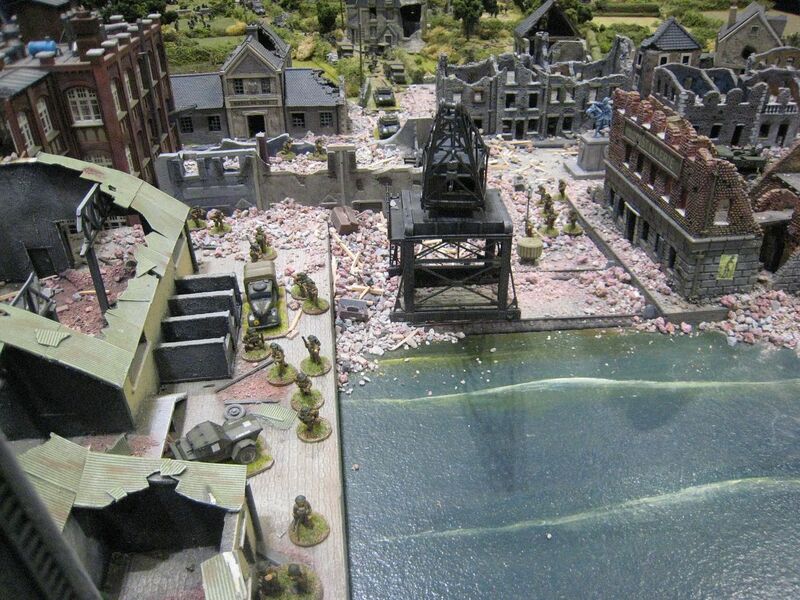 Dunkirk in (I think) 25mm; unfortunately I didn't catch who from. 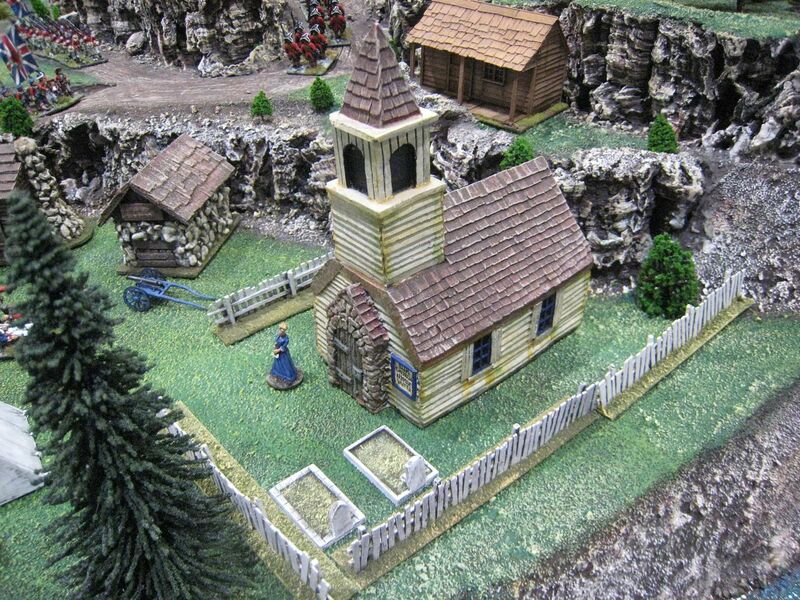 Again, the terrain and detail were superb. 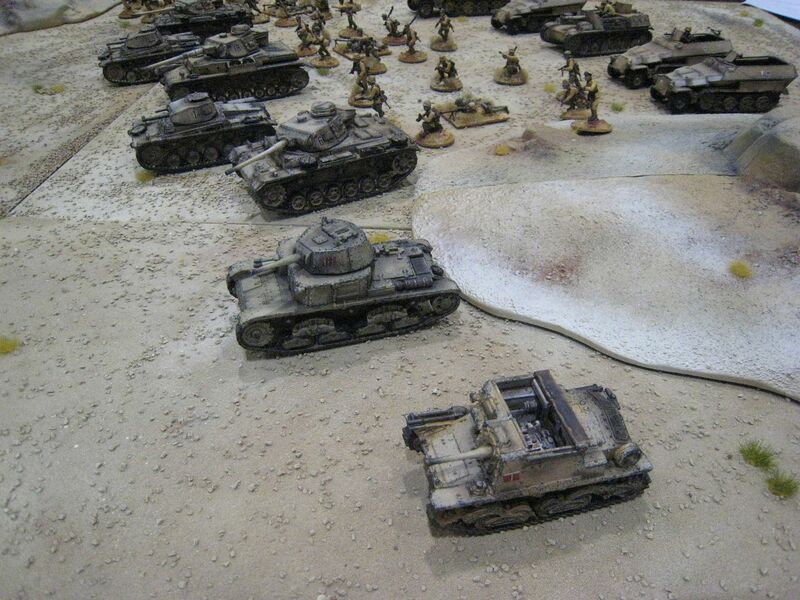 I thought also that this sort of WW2 game, where there are a small number of figures facing armour and superior numbers really bring home the terrifying reality of WW2 battle. 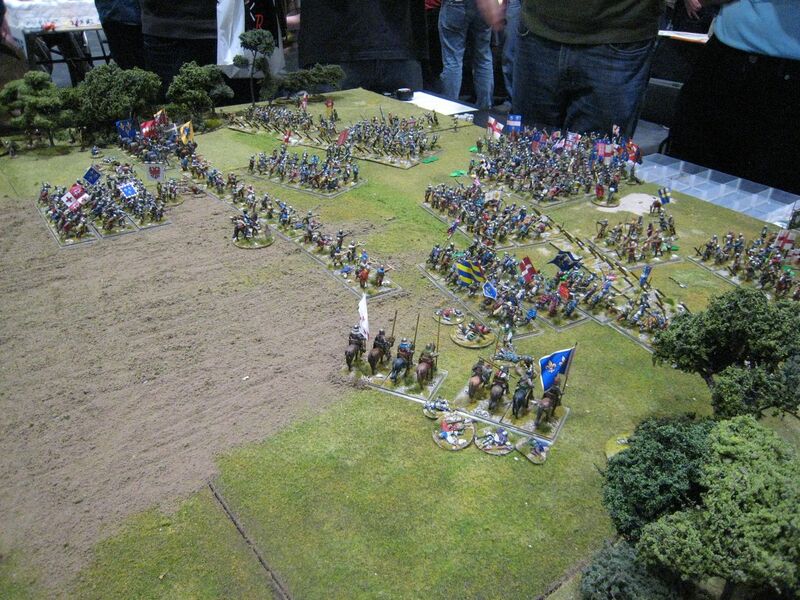 The Royal Air Force Wargaming Association had a brillant game of "Sharpe's Waterloo". 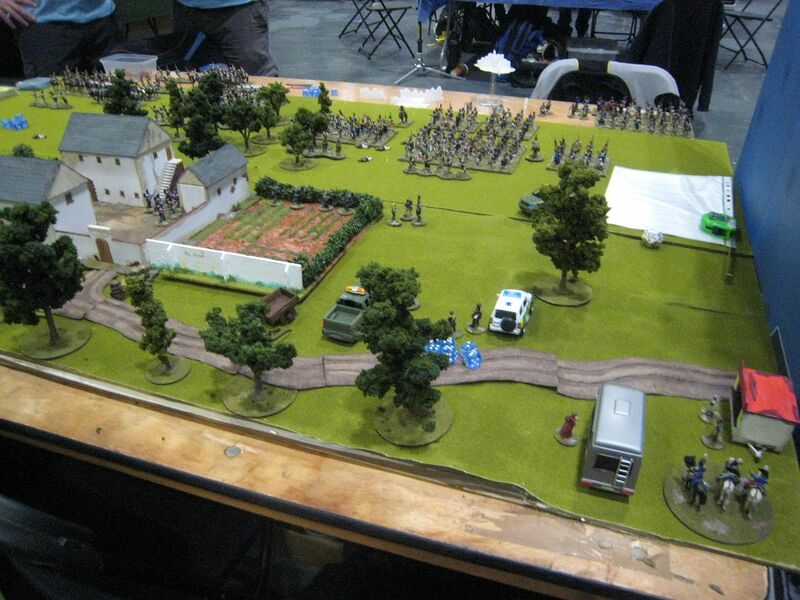 This was a game of the making of the television show rather than Waterloo itself, so the table had camera crews, a canteen van and other associated vehicles. There was a card system for random events, such as Sean Bean leaving the "battle" to chat up the female producer. 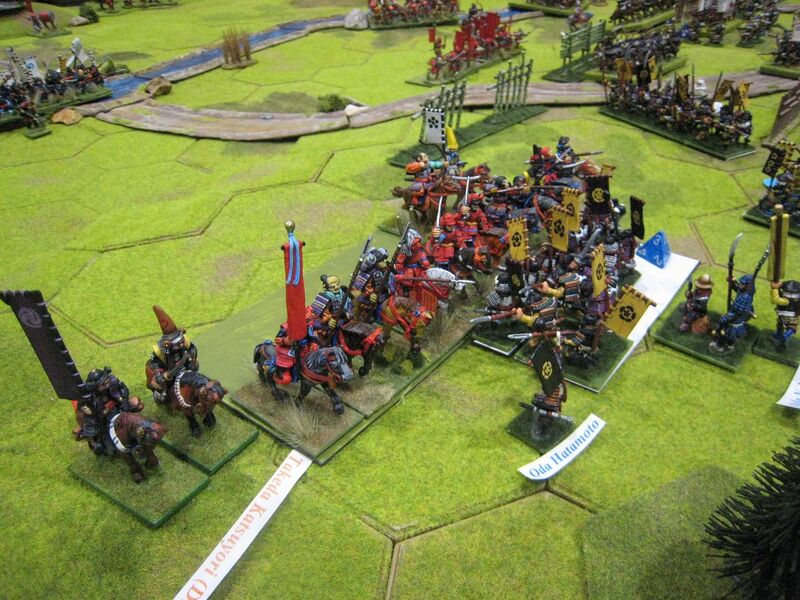 This Agincourt in 15mm from Ancient & Modern Army Supplies and Donnington Miniatures was superb. 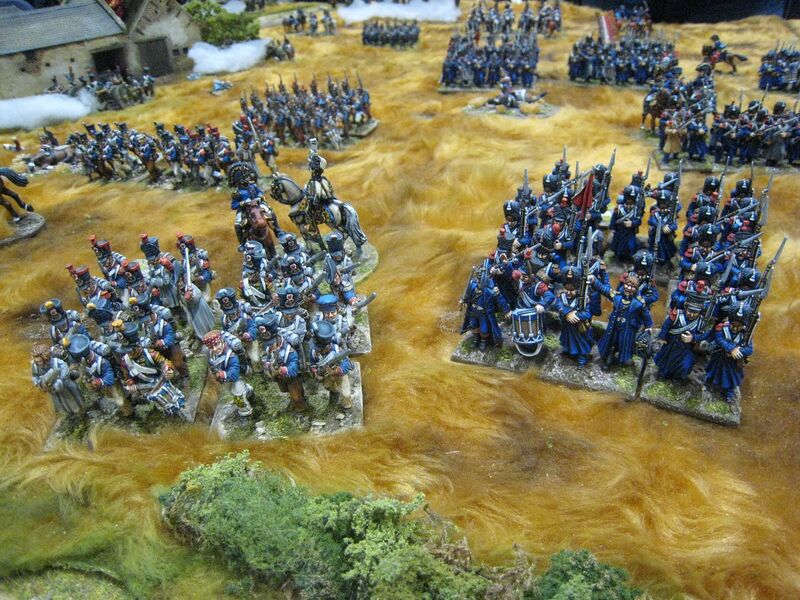 I loved the ploughed-up look of the terrain and the space created - the waves of French were clearly delineated. 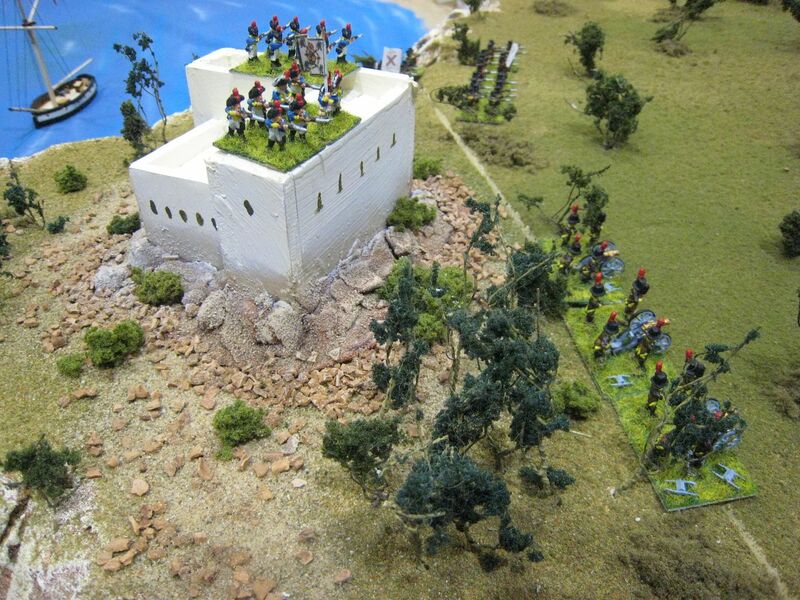 More stunning terrain from Southend Wargames Club with their 10mm Napoleonic siege of Rosas 1808. 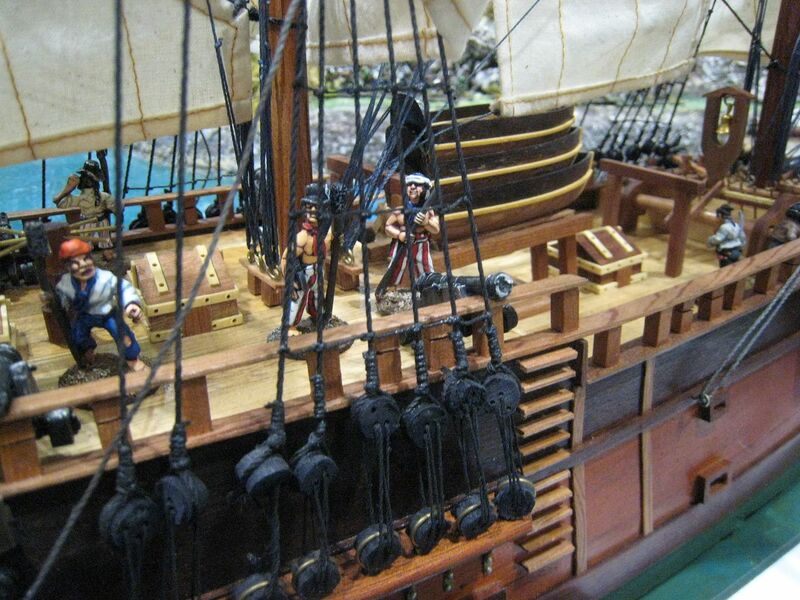 Lovely mdf ships and played with Capitan Games rules. 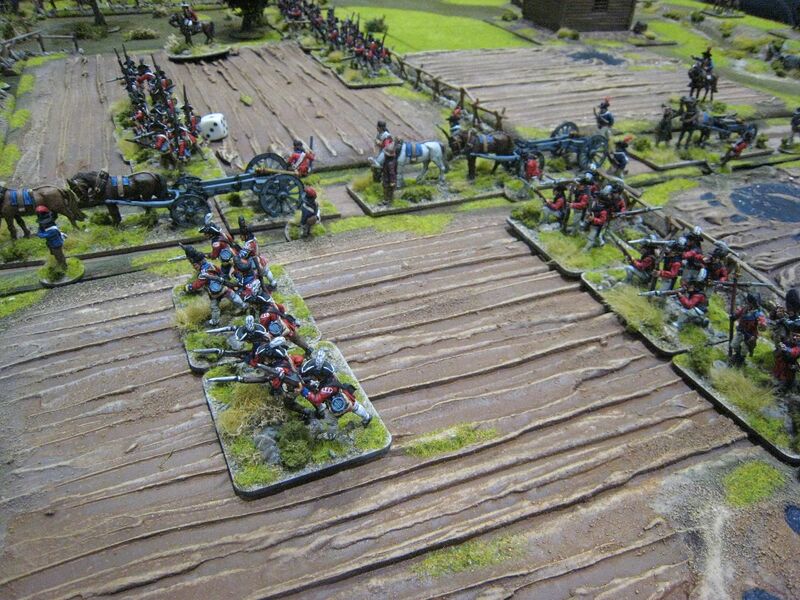 Loughton Strike Force had their usual 25mm Waterloo loveliness. This particularly appealed to me because the final attack of the Guard is the part of the battle's orbat that I've slowly been painting up over the past few years. 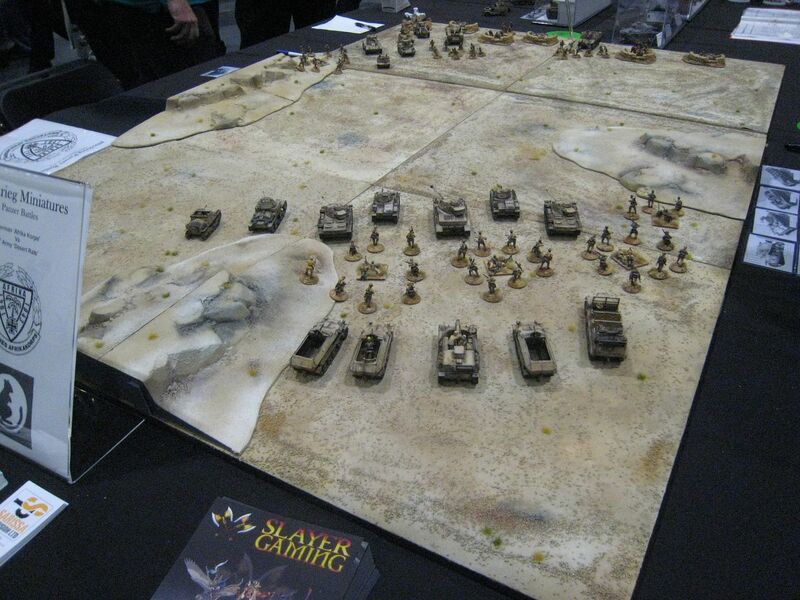 Blitzkrieg Miniatures were showcasing their Panzer Battles rules with two WW2 games, including this 25mm desert one. 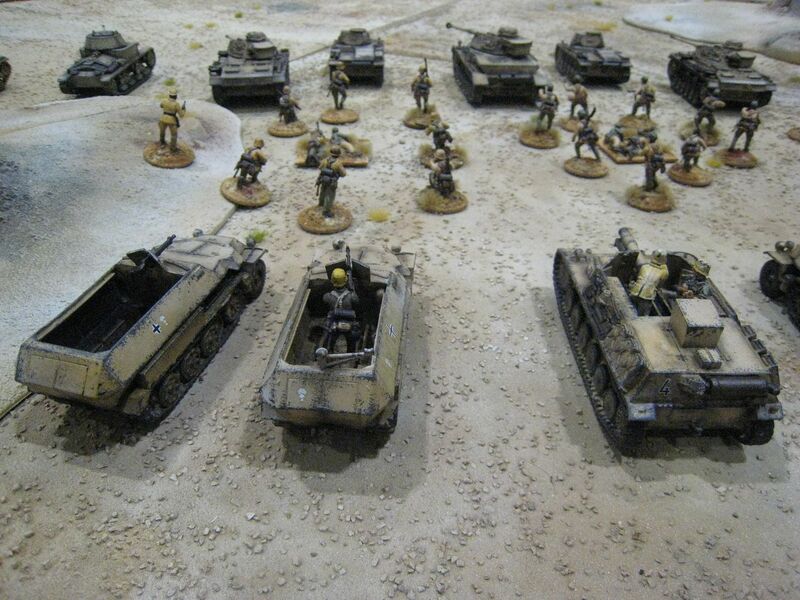 When I first saw the tanks and vehicles I thought they were mdf! 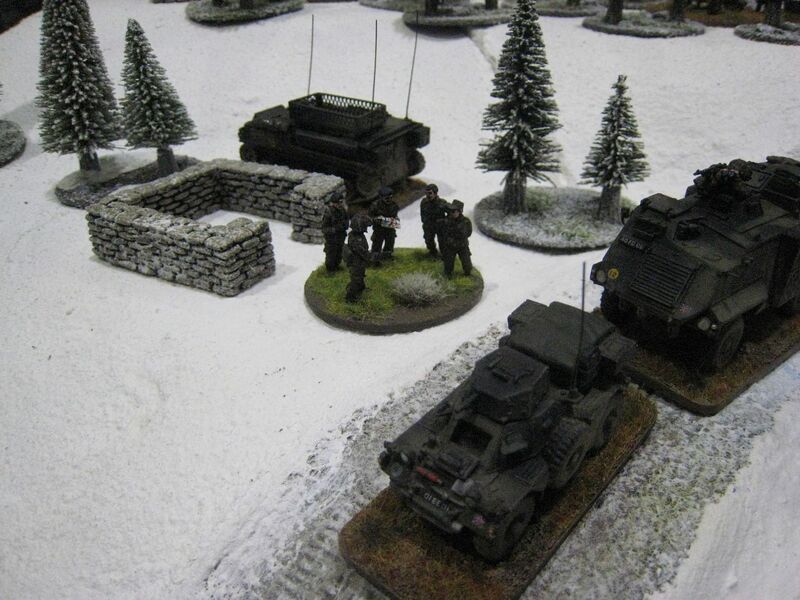 Another wintry scene, WW2 Ardennes action; unfortunately I didn't catch the name of the team responsible for it. 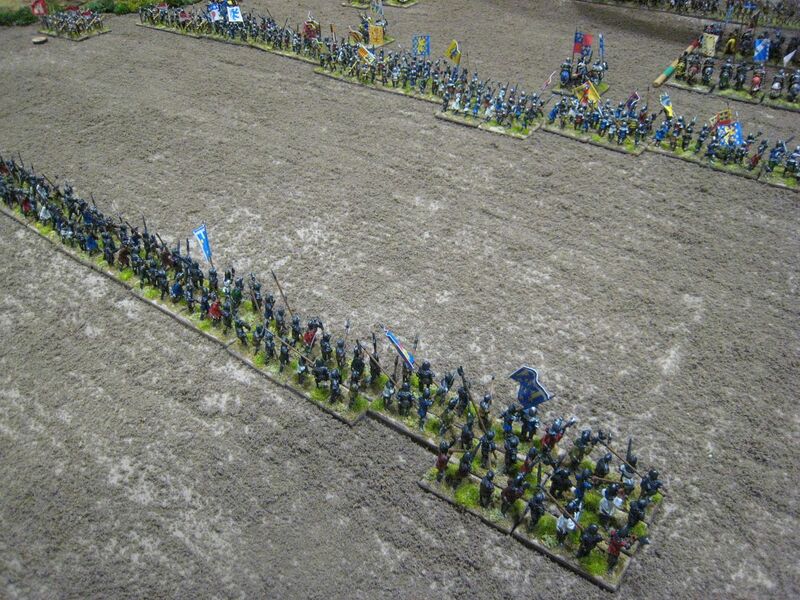 Simon Miller had Cremona AD69 in 25mm. 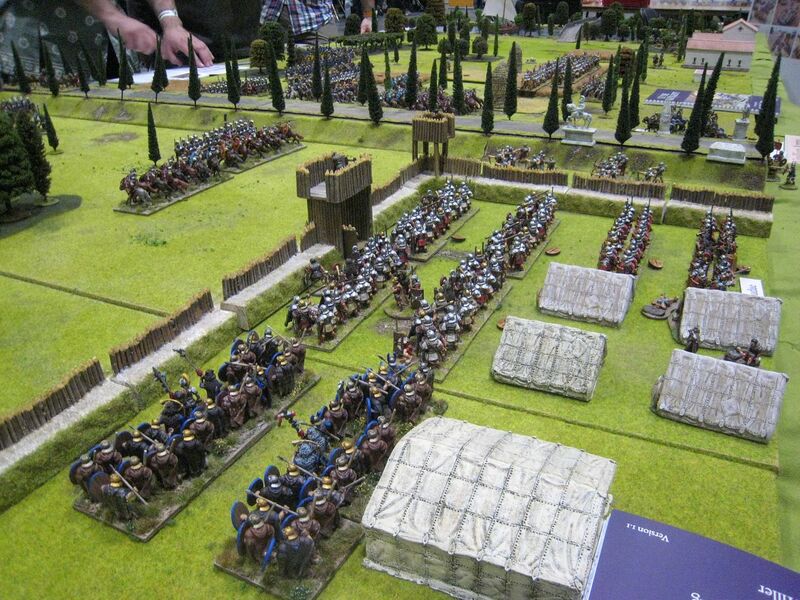 Once again, lovely terrain and you can't beat a bit of Roman civil war. 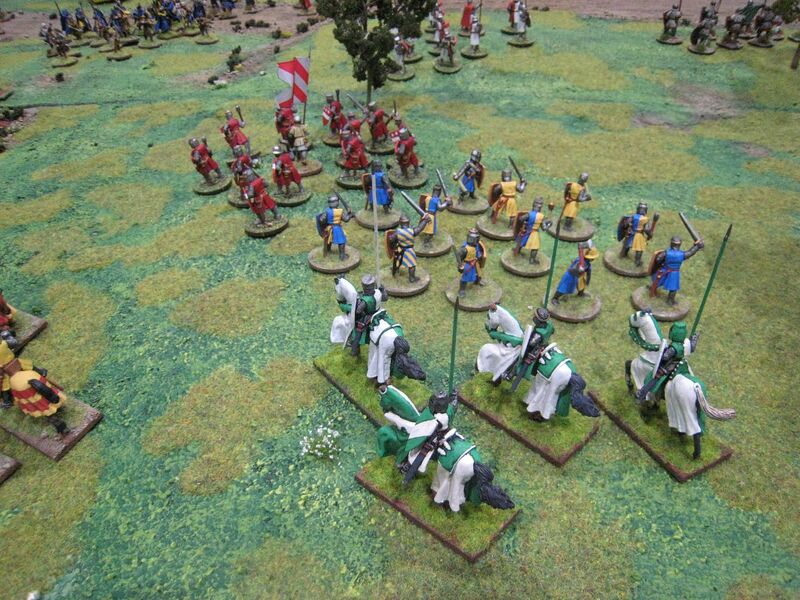 Last, but very much not least, we have the 25mm Agincourt from the Lance and Longbow Society and Simon Chick. 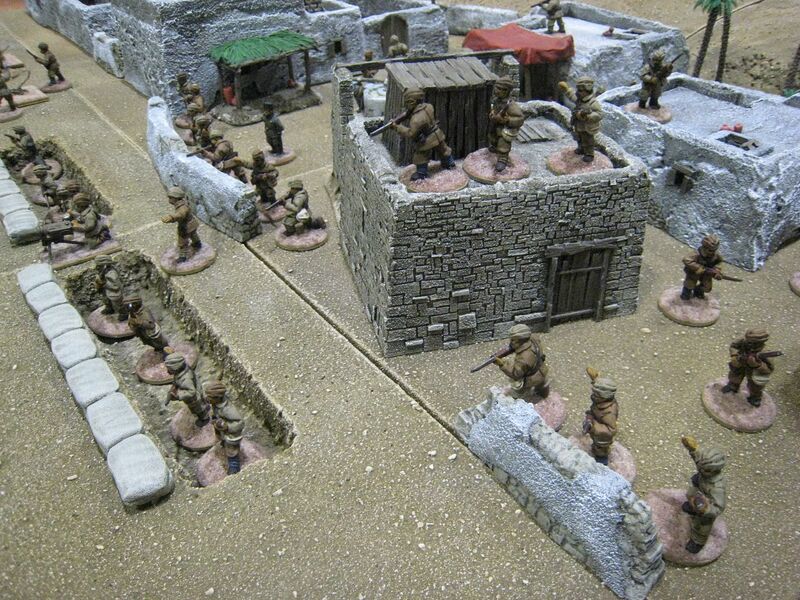 Simon wasn't there when I passed by, but the figures and terrain were, as ever, stunning. 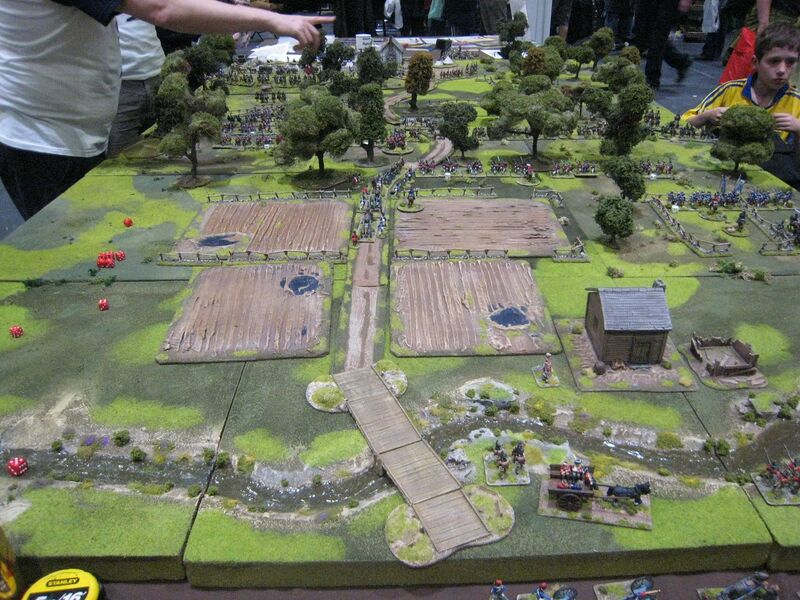 4Ground had various mini-games to showcase their mdf sets. 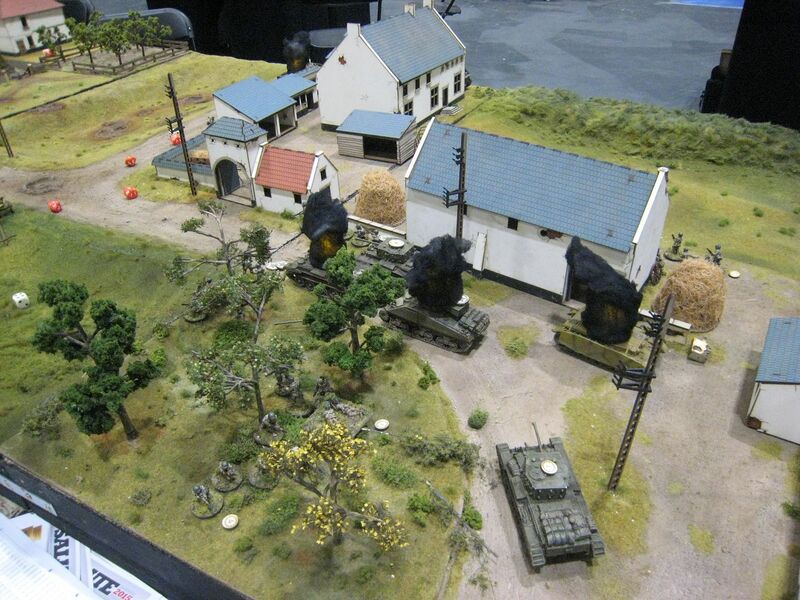 This WW2 one looked very nice. 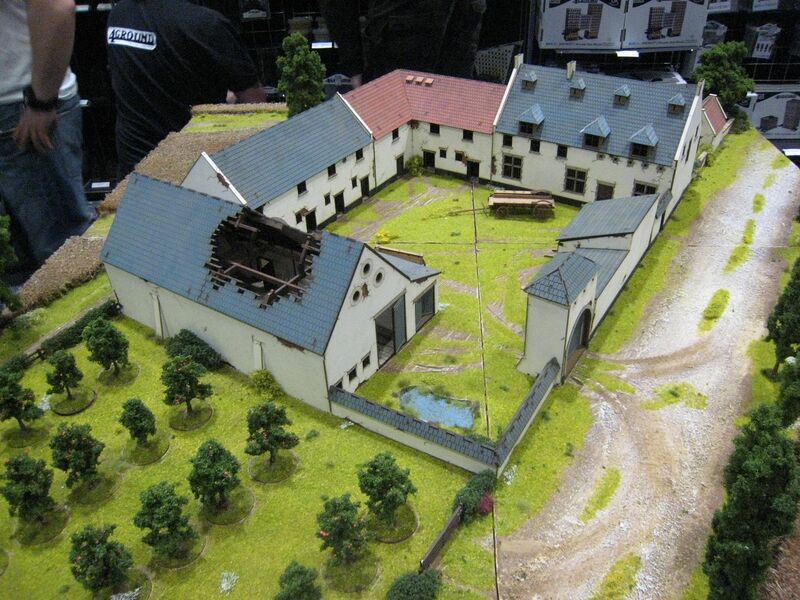 I'd been tempted by the 4Ground La Haye Sainte mdf set when it was released but Timmo had warned me that it was big. It was out for inspection at the show and it really is massive. 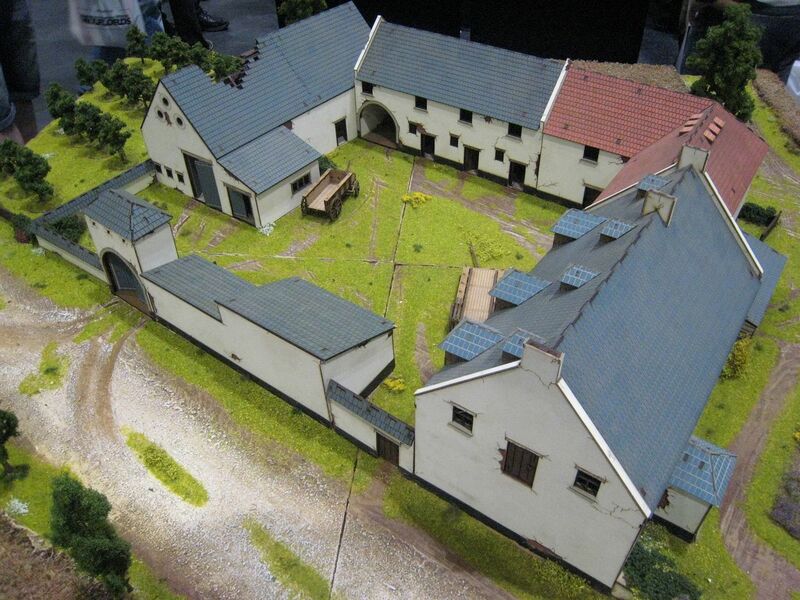 In all the rush to release mdf kit buildings, it seems to me that little thought has been given to table footprint and gaming practicalities. 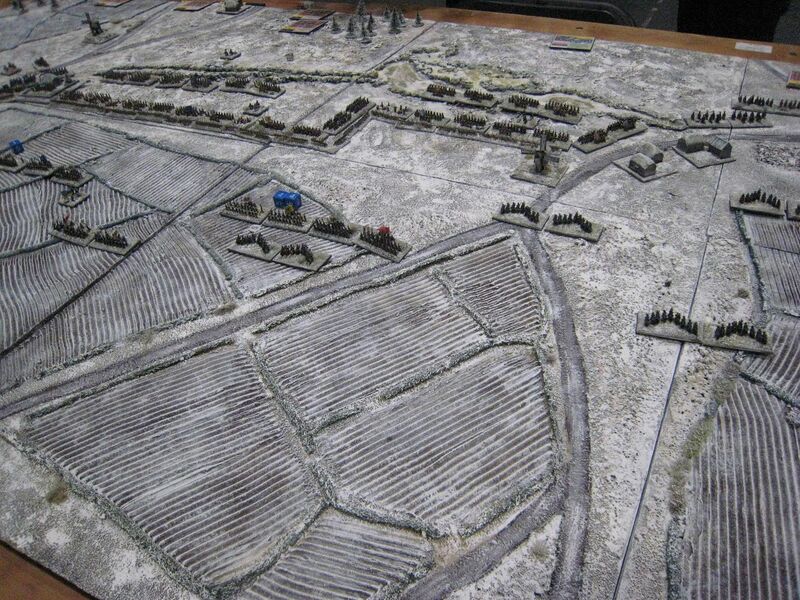 The size of this model means it can only really be used for a scenario based purely on the fight for LHS and then at a low figure/man ratio, as even at 1:20 the garrison would be dwarfed by the model. 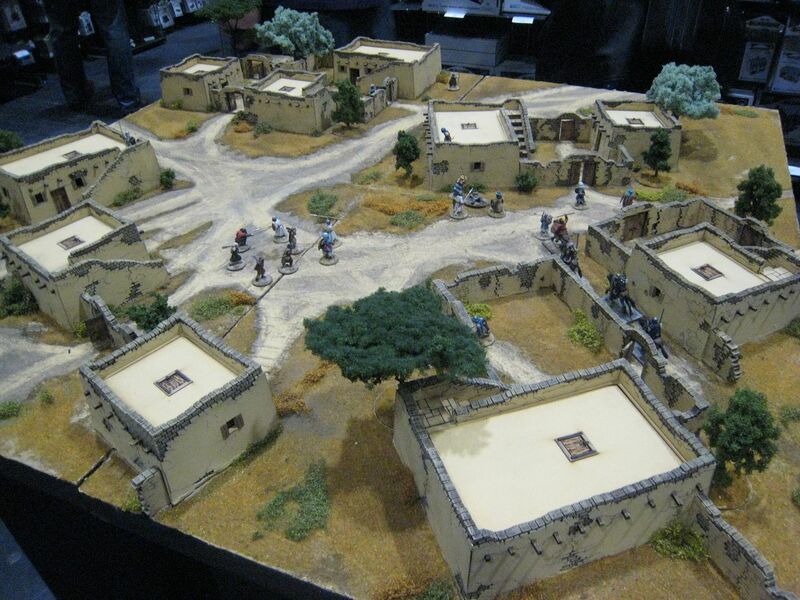 4Ground's middle eastern buildings looked pretty good, albeit again a bit on the large side. That's it for another year. Salute is the only show I get to these days.